One of the things I love most about living in the PNW (aka Pacific Northwest, for those not in the know) is the close proximity to nature. Water, mountains, forests, beaches – we have it all. 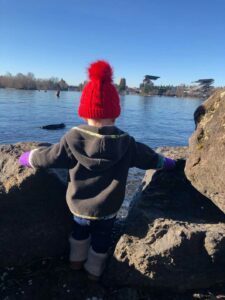 When my daughter was born about a year and a half ago, I was so excited that she was a native Seattlite and would never not know the outdoor world that I have grown to love. I was bound and determined to get her out on the trail as soon as possible. Fortunately, this region offers trails for a wide variety of skill levels – including beginners with little legs. This is arguably one of the most idyllic trails to hike along the Puget Sound, regardless of whether or not you have kids in tow. Part of the adventure of Ebey’s Landing is getting there as your 40-minute journey to the trailhead includes a ferry ride to Whidbey Island. Once you arrive, it’s tempting to spend time playing on the beach, but I encourage you to find the 5.6-mile loop trail and start up the ridge first, saving beach time for the return trip. 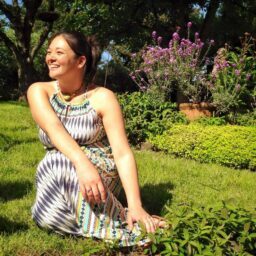 The trail will start somewhat steeply (another reason to start with this, while your kids still have energy) so allow yourself to take your time. Once you hit the top of the ridge, however, you’ll gaze across the Strait of Juan de Fuca at the stunning Olympic Peninsula and the views will make it all worth it. This is possibly one of my favorite places to bring my daughter – and one of the easiest for her to navigate. From gravel trails meandering through azalea gardens to wooded boardwalks over duck-filled marshes, there is plenty to discover. I highly suggest the Foster and Marsh Island Loop for a fun adventure on the boardwalks. If you’re so inclined, consider popping into the carefully manicured Japanese Garden, located in the Arboretum grounds, to say hello to the koi. Jutting out like a thumb into the southern end of Lake Washington, Seward Park features a paved 2.4-mile loop around a grove of old-growth forest. 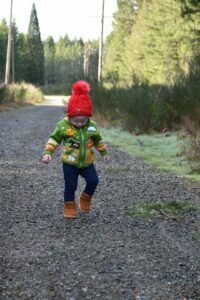 If your little ones are willing, lead them up the dirt trails that wind through the trees, knowing that they all loop back to the pavement so there’s no getting lost. 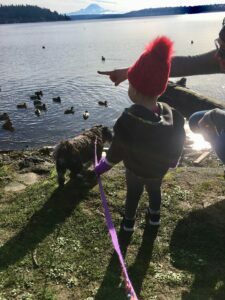 Encourage your kids to enjoy the trails first, then end at the playground near the parking lot, often featuring ducks, geese, and perfectly-framed views of Mount Rainier. Cougar Mountain, Squak Mountain and Tiger Mountain make up the majority of what locals refer to as the Issaquah Alps. Despite this potentially daunting name, these mountains are actually foothills that lead up to the Cascade Range and offer a variety of trails and interesting points for little explorers along the way. Some of the more popular trails in this area include a climb to Poo Poo Point (1858 ft. elevation gain over 5.5 miles) and the shorter, flatter trek to Coal Creek Falls (416 ft. elevation gain over 2.5 miles). We found success with our toddler on the Tradition Lake Loop (150 ft. elevation gain over 2.9 miles) as she was able to walk a large portion of the trail on her own. As my daughter gets older, I encourage her to hike part of the trail on her own, but I am super conscious of the fact that she will tire long before I will. 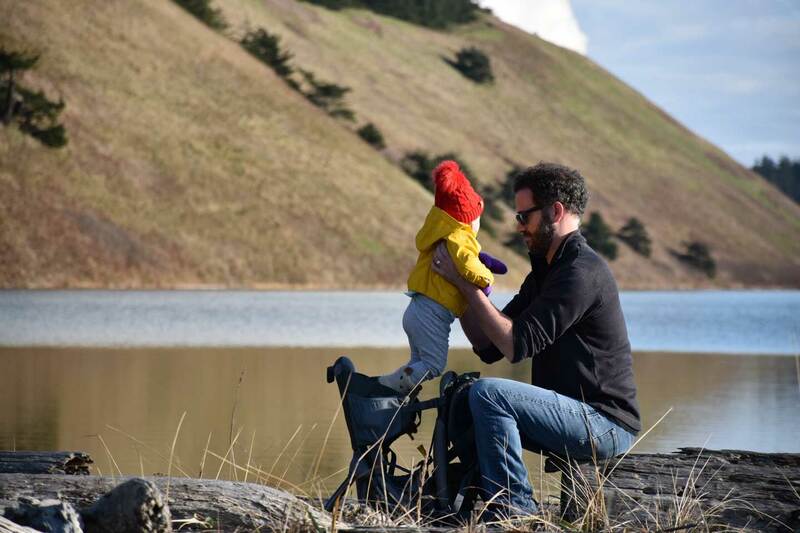 I am a huge advocate of bringing along a hiking backpack so your little one can catch a ride. Ours is a Deuter and we invested in the sunshade and rain cover. My daughter loves being up high so she can see things along the way. She often spends our trail time playing with my hair, babbling in my ear, and even falling asleep as she gets tired. This setup allows us both to enjoy the trail at our own pace. 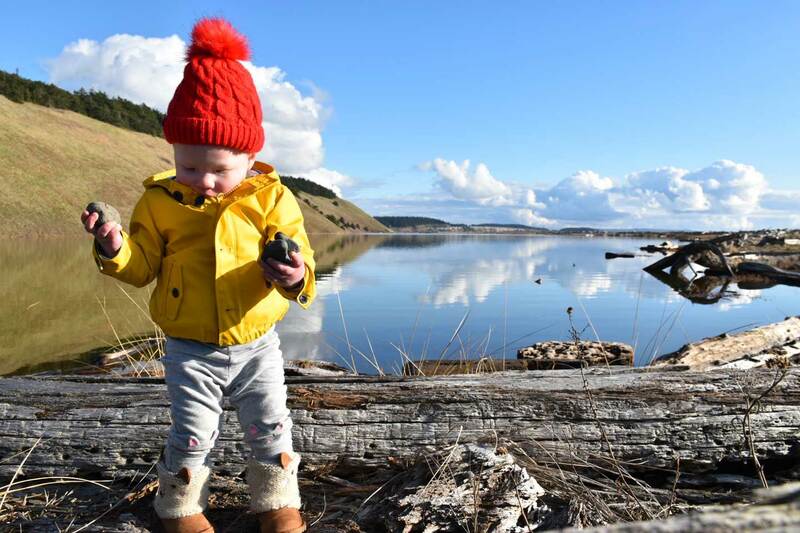 If you’re flying into Seattle with a little one, consider bringing a hiking backpack instead of a stroller – whether or not you’re planning to go on a hike. You can wear it through the airport and check it at the gate, leaving your hands free and saving yourself the hassle of keeping track of your child while maneuvering through the crowds. 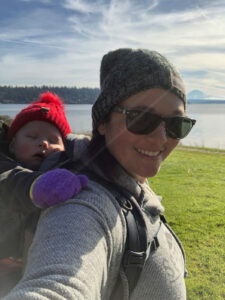 It’s also great for sightseeing once you get to Seattle – believe me, you’ll prefer the backpack over pushing a stroller through the crowded, cobble-stone streets of Pike Place Market. Besides, toting your kid around on your back will let you fit right in with that outdoors lifestyle.